When perfectly ripe, peaches are the juicy taste of summer holidays. We cooked Spanish peaches this week, bringing the sunshine to our kitchen with a bite through their soft skin and bright orange flesh. Have a look at www.forkful.tv for our peach and balsamic salad video for another idea of what to do with these summertime beauties. This is a version of a recipe by Barney Desmazery, one our favourite food writers. We use the same ingredients but simplify the method. You’ll find his version here at http://bit.ly/BarneyAlmondTarts. Put the almonds and softened butter into a mixing bowl. Use an electric whisk to beat together until fluffy. Add the egg and beat once more until well-combined. Set aside. Use a small teacup saucer to cut six to eight circles into your puff pastry sheets. You should get three circles out of each sheet. Carefully transfer your puff pastry circles to baking trays greased with butter, being careful not to pack the tarts too close together. Add a tablespoon of the almond, butter mixture to the puff pastry circles. Use a sharf knife to cut your peaches into thin quarter slices and carefully arrange them in the shape of a fan on the tarts. So pretty! Pop them in the fridge for 10 minutes while you pre-heat the oven to 220C/200C fan/Gas Mark 7. Bake the tarts for 10 minutes. Remove from the oven and sprinkle a bit of muscovado sugar over the top of each tart. But them back in the oven for 5 to 10 minutes, until the sugar has caramelised and the puff pastry is risen and golden. These taste great served straight but can also be served cold a few hours later. Heat the knob of butter in a griddle or frying pan over a medium to high heat. Fry the slices of peaches until starting to caramelise around the edges. 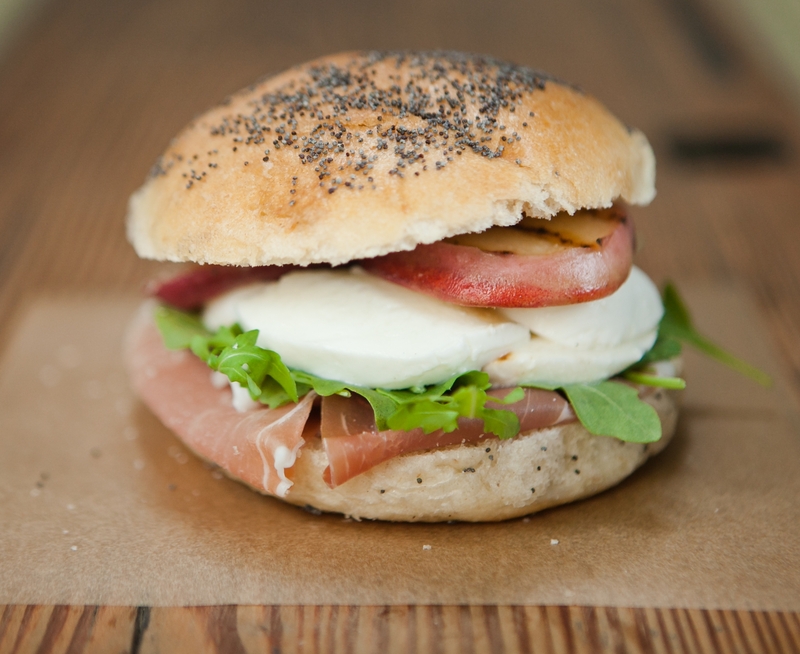 Layer your bread roll with rocket, parma ham, mozarella slices and, finally, the grilled peaches. Finish with a drizzle of runny honey.